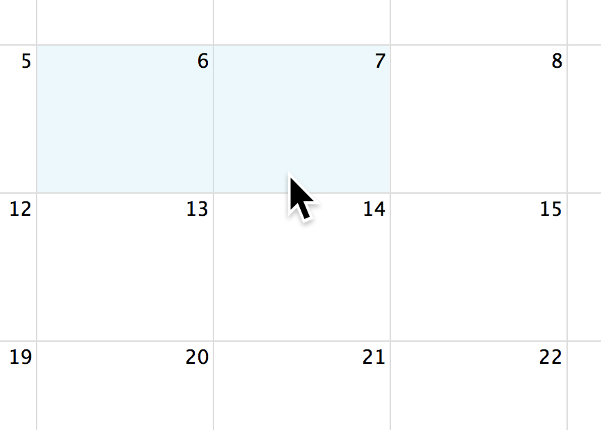 Detect when the user clicks on dates or times. Give the user the ability to select multiple dates or time slots with their mouse or touch device. 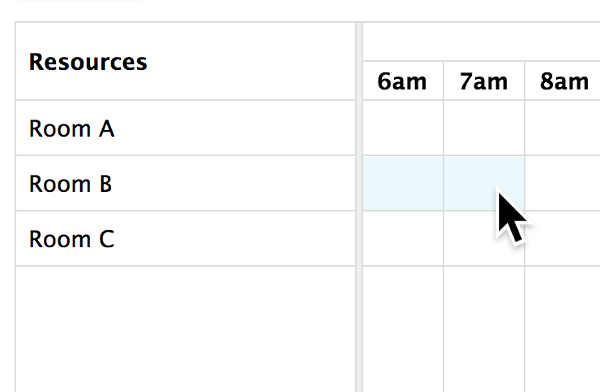 Allows a user to highlight multiple days or timeslots by clicking and dragging. Whether to draw a “placeholder” event while the user is dragging. A way to specify elements that will ignore the unselectAuto option. Limits user selection to certain windows of time. Exact programmatic control over where the user can select. The minimum distance the user’s mouse must travel after a mousedown, before a selection is allowed. Triggered when a date/time selection is made. A method for programmatically selecting a period of time. A method for programmatically clearing the current selection. Whether to automatically scoll the scroll-containers during event drag-and-drop and date selecting. The time interval at which a dragged event will snap to the time axis. Also affects the granularity at which selections can be made. FullCalendar’s Touch support includes smooth scrolling, time-range selection via long-press, and event drag-n-drop/resizing via long-press.